David Cruise says partnerships to raise up a workforce for CRRC MA USA. will benefit the region’s entire manufacturing sector. When a company from across the globe sets up shop in Springfield, it can’t exactly bring its workforce with it. That’s why CRRC has forged a number of interlocking partnerships — with the Regional Employment Board (REB) of Hampden County, the local sheet-metal and electrical unions, Roger L. Putnam Vocational Technical Academy, and the engineering departments of area colleges and universities, for starters — to build that workforce. 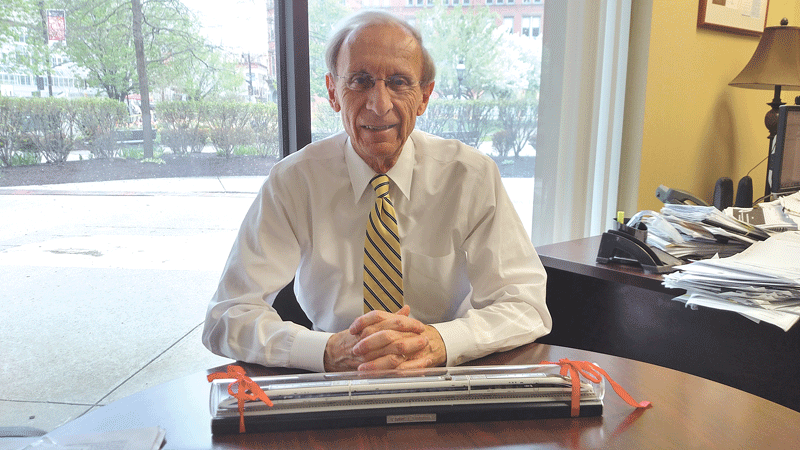 But local economic-development leaders see potential benefits to these partnerships beyond the CRRC jobs, said David Cruise, the REB’s president and CEO. He explained that CRRC could present some spinoff work for other manufacturers and perhaps attract new manufacturing business to the region. Construction at the 40-acre site — including a new, 220,000-square-foot factory building and conversion of the former Westinghouse administration building into CRRC’s administrative, engineering, and research offices — is underway. When it’s fully operational in 2018, the factory will employ 150 production workers with starting salaries of at least $66,000 a year, on top of about 150 construction workers needed to build the new plant. The MBTA cars will be built over a five-year period. To develop a worker pool with the necessary skills, the REB is working closely with Sheet Metal Workers Local 63 and Electrical Workers Local 7 to develop training programs to be hosted mainly at Putnam after school hours. “Putnam has some of the latest technology and equipment in the area, and I felt it was really critical to build that relationship between Local 63, Local 7, and Putnam,” Cruise said. Along with training workers currently in the field for CRRC’s immediate demand, another goal is to attract unemployed and underemployed individuals into the training programs to prepare for a surge in demand as the rail-car plant grows beyond its initial buildout. Cruise believes that, indeed, CRRC will be that kind of catalyst. Once the initial hiring process is complete, a group of 20 to 30 employees, maybe more, will relocate to China for 10 months to a year to train on light rail cars in that country, learning how to test all the systems in the trains and bringing that technology back to Springfield. A second group of employees will go to China for four months to learn the assembly process. Production of the MBTA cars will begin in Springfield early in 2018. CRRC is starting to build other connections as well, working with Western New England University’s College of Engineering to develop talent for the design and research operations at the new plant, and examining similar opportunities with UMass Amherst and Springfield Technical Community College. Meanwhile, FutureWorks, the one-stop career center located in Springfield, will serve as a resource for the hiring process. “For them to be able to see that these kind of partnerships can be developed quickly — that they’re coordinated, agile, flexible, and can respond to their business demands — to me is adding great value and ensuring this corporation, and the industries that will benefit from it, will have a very bright future, not only here in Massachusetts, but across the country,” Cruise said. Doyle admitted that, during CRRC’s search for a North American home, Springfield posed some negatives, including one of the highest commercial tax rates in the Commonwealth. But other positive factors outweighed that, including the city’s proximity to two major interstates and a CSX Transportation rail line, and, yes, those aforementioned partnerships, and the enthusiasm of the municipal and economic-development leaders who forged them.